Nancy L. (Diver) Walck, 95, of Monroe, died Friday, November 23, 2018, at Mt. Pleasant Retirement Village. She was born in Middletown, Ohio on February 2, 1923 to parents Norval and Jessee (Deem) Diver. Nancy retired as a secretary from Inmont Corp. after 12 years of service. 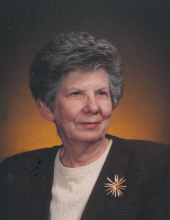 She was a member of First Presbyterian Church and the Monroe Garden Club. She loved the outdoors, birds, gardening, playing bridge, where she was in numerous tournaments. Nancy was an avid reader and enjoyed crossword puzzles. Mrs. Walck is survived by her sons, Richard (Susan) Walck and Stephen Walck; grandchildren, Danielle (Shawn) Ayers, Lauren Walck, Kristin (Luke) McNair, Leslie Walck and Hallie Walck; great grandchildren, Corinne and Greyson Ayers and Eleanor Rose McNair; brother, Dan (Manami White) Diver; and sister, Sharon (Bob) Fuge. Nancy was preceded in death by her husband, John Walck, parents and son, Gary Walck. Funeral Service will be held Wednesday, November 28, 2018 at 12:30 pm at WILSON-SCHRAMM-SPAULDING FUNERAL HOME, 3805 Roosevelt Blvd., Middletown with Reverend Michael Isaacs officiating. Visitation will be Tuesday, November 27, 2018 from 5:00 - 7:00 pm. Interment will be at Mound Cemetery. Memorial donations may be made to First Presbyterian Church, 2910 Central Ave., Middletown, OH 45044. To send flowers or a remembrance gift to the family of Nancy L. (Diver) Walck, please visit our Tribute Store. "Email Address" would like to share the life celebration of Nancy L. (Diver) Walck. Click on the "link" to go to share a favorite memory or leave a condolence message for the family.